The traditional German beer style Märzen takes its name from the month of March when, in pre-refrigeration days, there would be a final flurry of brewing activity before the onset of the warmer months that rendered brewing a much trickier prospect. They’re a chunky part of the lager legend, where beers were stored away in caves for several months to ferment in readiness for consumption on other side of summer. Although refrigeration has rendered the old technical limitations obsolete, the beer world still very much gets on board with the whole vibe of the Märzen’s autumnal release, and nowhere more so than at and around Oktoberfest. It’s with much of that in mind that Stockade has released its homage to the classic festival beer. 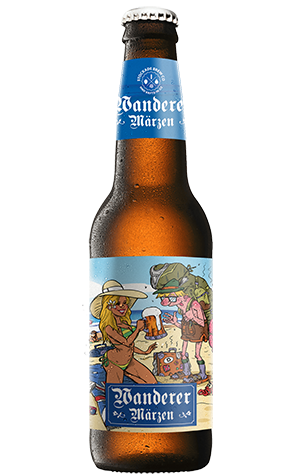 Wanderer has been brewed using all German ingredients: a bock lager yeast; Munich, Vienna and Pilsner malts; Hallertau and Hallertau Mittlefrüh hops. It’s a lovely colour, somewhere in the amber to copper spectrum, and at six percent ABV is towards the top end of the range as far as typical festbiers are concerned. Being a degree more potent than your average Aussie lager in no way lowers the drinkability, its clean and slightly dry finish coming off the back of a nice touch of breadiness and light herbal notes of the German hops. Should you not have had the pleasure of being at Oktoberfest, or have never come across a Märzen, this local interpretation will give you a fair idea of what the Bavarians are enjoying.